The name is V字135度/ V-shape module and for the variation 中折れV字135度 or V-shape module with additional folds. 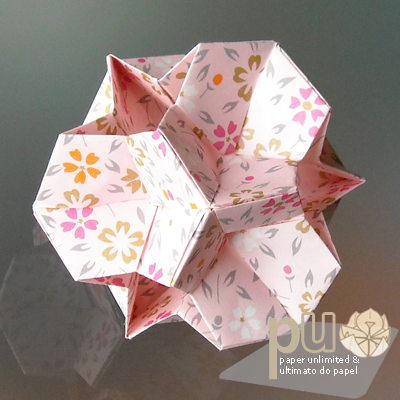 This one is in a Origami Tanteidan Magazine number 109. Oh, I must say that I have read some comments regarding that there were difficulties in buying OTMs. I will buy some more around Easter, so I’ll post about it when I do. Until then you might try to buy them from a japanese book store, a fnac or some japanese items related store, perhaps…? 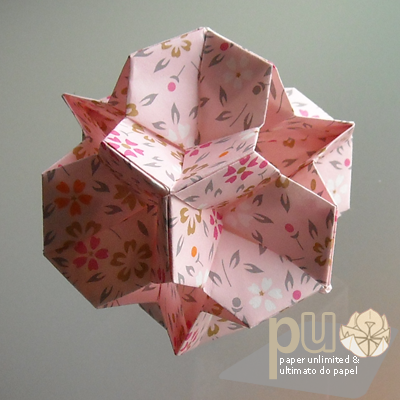 Now with a cherry blossom themed origami paper, the 12 units one. This one I assembled it differently from the first! 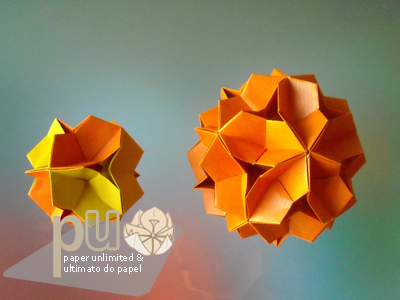 You can see the difference if you look at the holes in the kusudama; these have a 4 point star shape instead of the 3 point star shape (; I like both. I might be repeating myself, but beautiful is the word to say! 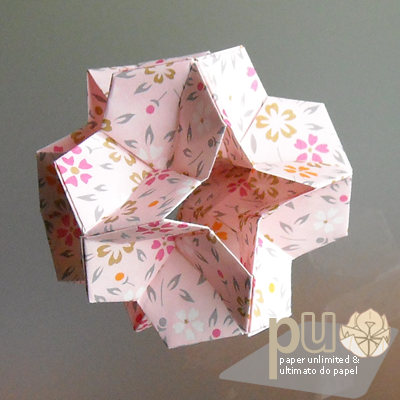 I like this kusudama so much! 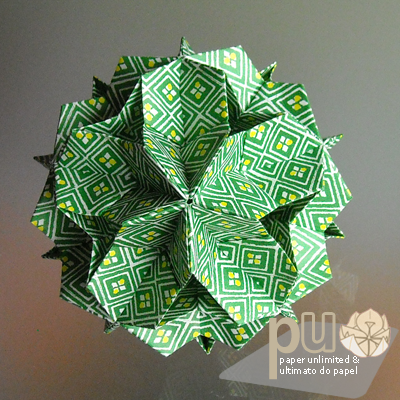 This is also origami paper, a traditional pattern in green and yellow; this is a 30 units kusudama. 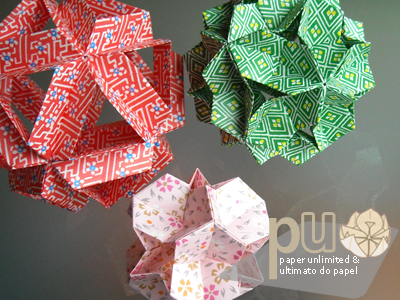 This kusudama doesn’t need glue as most of Fuse’s kusudamas and is really sturdy! 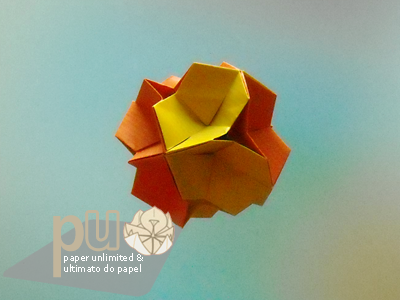 Be it in kraft or in a stronger paper. 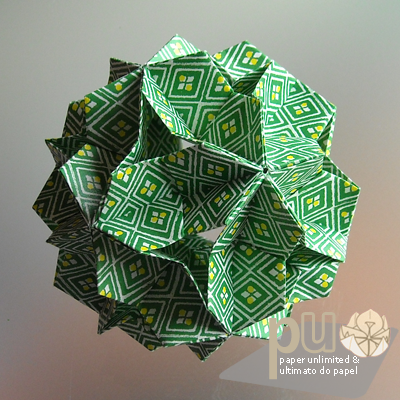 All papers were 7x7cm/ 2,75″. 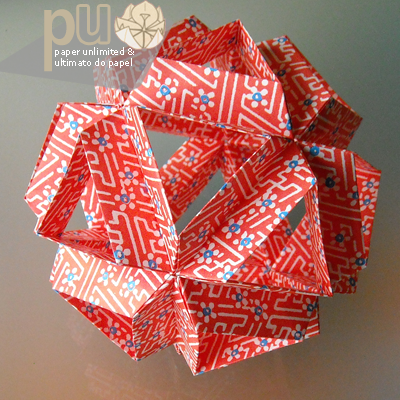 Both 12 units kusudama have a diameter of 7cm/ 2.75″ and the 30 units one of 10cm/ 3,94″. The diameter of the one without additional folds is 14cm/ 5,50″. 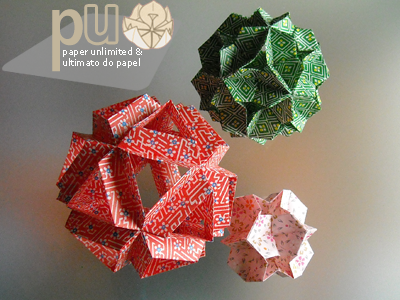 In these last pictures a 30 units kusudama of the variation unit, without the centre/ additional folds. 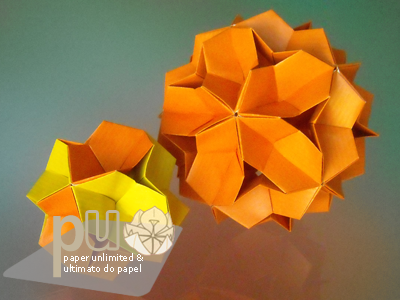 I like the kusudama better with the centre fold but I really like the fact that the unit permits simpler assemblies (: The paper has the same size of the other ones but the fewer number of folds make the unit larger and, as such, a bigger kusudama. 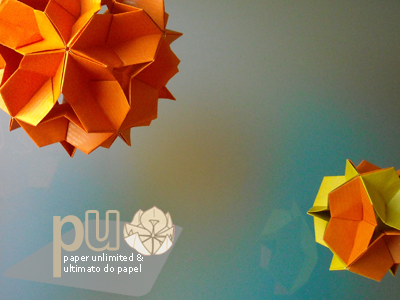 This one was also made in origami paper with a traditional pattern! 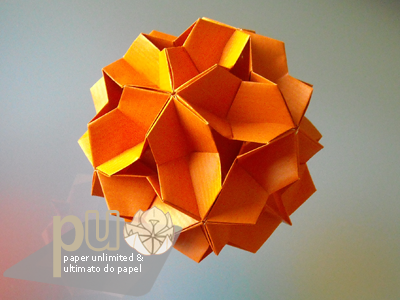 This entry was posted on 2010|12|03 at 21:00 and is filed under kusudama, modular origami, origami. You can follow any responses to this entry through the RSS 2.0 feed. You can leave a response, or trackback from your own site. Don’t you have a video tutorial? i woul’d really like to make this one! Thanks!